Nah, he was just tired of winning. Fast graphics, man. Fast graphics. Fwiw, I doubt the GOP has the stomach for another shutdown in 3 weeks. There's no education in the third (fourth, fifth?) kick. But Trump will try the state of emergency gambit. 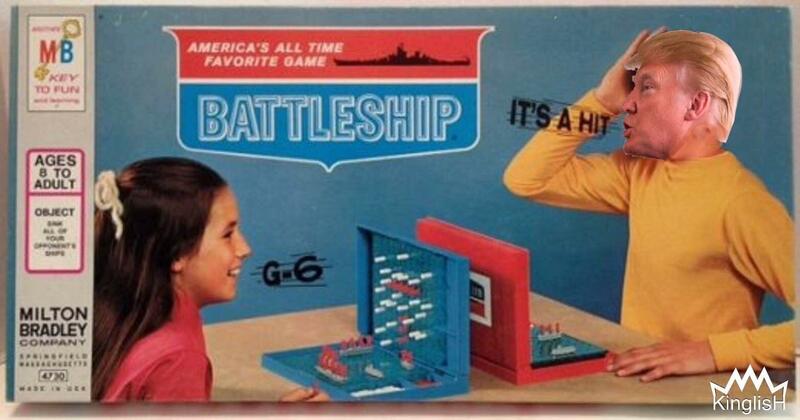 PS I just googled "Trump battleship game"
America will not perish as long as it believes in its great historic mission, The Wall! Ann Coulter criticizes Trump for caving. Despite the suffering and confusion, she does not budge. This is the Republican base. Rational people should be fleeing the GOP. Yes, the way one word plays into another. NCD started so I am adding a tune. Wasn't it GHWB, "right wing wimp" for raising taxes? And Trump tried goofy Alpha tricks on Jeb mostly, I looked it up, called him "low energy Jeb Bush". Actually the Wimpy meme made me recall that recently it was pointed out how appropriate a nickname that might be for Trump. Amazing. Democrats were willing to give Trump 1.3 billion for the wall but Trump wanted 5.7 billion so he shut down the government. In the final deal he gets nothing. Greatest negotiator ever!! On borderlines, seeking asylum, "walking to redemption" and finding a way to a new life. It is annoying to read all the stories centered upon Trump blowing something up for the first time. He just keeps doing the same thing no matter what and the circumstances have changed. Describing it as a tactical mistake is CPR for a political entity that never actually existed. She's rolling a slow-build impeachment strategy. There must be a video game or wrestling move that is an adequate metaphor? Note the air traffic controllers pointed to him for shutting down flights. I figure McConnell met with Trump and warned him that if he didn't end the shutdown, the Senate would do it without him. I figure McConnell's starting to worry about his own skin. According to Jonathan Swan at Axios, this is more less what happened. [....] on Friday, Pelosi said she felt optimistic that there would not be a shutdown again, owing to the likelihood that Trump will have recognized how politically damaging the current standoff had been. McConnell is a professional bog creature, there to con the fetus obsessed maggats while creating an anti-democratic authoritarian theocracy that loots the Treasury for the rich, cages brown children and anoints serial adulterers, liars and assorted grifters and tax evaders as Bible prophesied saviors of the race of bigots and yokels who elect them. ....according to three people with direct knowledge of the events. I just wanted to say this is an awesome comment thread! I've been out of the loop on the shutdown and this has been a more entertaining and educational summary than Colbert or Seth Meyer provide. Hi Obey, just want to say it is a pleasure to see you say somethin' instead of just lurking, appreciation in case it may have been breaking a self-control rule. No need to respond. When I saw this, it made me wonder: where is Peter (unverified) and what is his take? [....] Kushner, who Trump jokingly says is to the “left,” pitched a broader immigration deal and had faith that he could negotiate a grand bargain in the coming weeks, according to people familiar with his discussions. He pitched a big deal to Latino groups this week and also with members of the Koch network, the people said. [......Rep. Peter] King faulted the conservative Freedom Caucus, led by Reps. Mark Meadows (R-N.C.) and Jim Jordan (R-Ohio), both Trump confidants, for steering the president in the wrong direction.